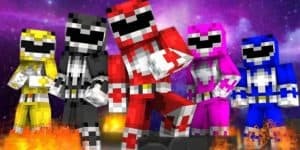 Minecraft Players Get Power Rangers Skin Pack Today | Nerd Much? Those of you still playing Minecraft have something new to be excited about this morning, as there’s a wave of new skins hitting as DLC today. Mojang will release the Power Rangers Pack for PC and console editions of Minecraft, which will not only include skins for all of the Power Rangers (yes, the Green Ranger, too) but also Rita, Megazord, Lord Zedd, Bulk, Skull, and Alpha 5. If you’re one of those people who doesn’t like the new look of the Rangers in the new movie that just released, fear not — these Power Rangers skins are based on the original Mighty Morphin Power Rangers show. The Minecraft Power Rangers Skin Pack is $2.99 on the Xbox Store right now, and we’ll have to assume it’s that same price elsewhere. And, best of all, the new skins actually look pretty great rendered in Minecraft‘s blocky aesthetic. Also hitting Minecraft today is the brand new Glide Mini Game. So, there’s that for you to check out as well. So, Go, Go to your console’s respective store and pick up the skin pack now, and stay tuned to Nerd Much? for more of the latest Minecraft happenings.